The Royal Palace of Madrid (Spanish: Palacio Real de Madrid) is the official residence of the King of Spain, located in Madrid. King Juan Carlos and the royal family do not reside in this palace, instead choosing the smaller Palacio de la Zarzuela, on the outskirts of Madrid. The palace is owned by the Spanish state and administered by the Patrimonio Nacional agency. However, the Palacio Real de Madrid is still used for state occasions. The palace is located on Bailén street, in the western part of downtown Madrid, east of the Manzanares River, and is accessible from the Ópera metro station. The palace is partially open to public, except when in official use. The palace also has the distinction of being the largest royal palace in Western Europe in size, with over a combined area of over 135,000m² and more than 2,800 rooms. The site of the palace dates from a 10th-century fortress, called mayrit, constructed as an outpost by Mohammed I, Emir of Córdoba and inherited after 1036 by the independent Moorish Kingdom of Toledo. After Madrid fell to Alfonso VI of Castile in 1085, the edifice was only rarely used by the kings of Castile. In 1329, King Alfonso XI of Castile convoked the cortes of Madrid for the first time. Philip II moved his court to Madrid in 1561. The Antiguo Alcázar ("Old Castle") was built on the location in the 16th century. It burned on December 24, 1734; King Philip V ordered a new palace built on the same location. Construction spanned the years 1738 to 1755 and followed a Berniniesque design by Filippo Juvarra and Giovanni Battista Tiepolo in cooperation with Ventura Rodríguez, Francesco Sabatini, and Scirmento. The new palace, directly facing the cathedral across the Plaza de Armas, was occupied by Carlos III in 1764. The vast palace is richly decorated by artists such as Velázquez, Tiepolo, Mengs, Gasparini, Juan de Flandes, Caravaggio, and Goya. Several royal collections of great historical importance are kept at the palace, including the Royal Armoury and weapons dating back to the 13th century, and the world's only complete Stradivarius string quintet, as well as collections of tapestry, porcelain, furniture, and other objects of great historical importance. Below the palace, to the west, are the gardens of the Campo del Moro that were given this name due to the fact that here in the year 1109, Muslim leader Ali Ben Yusuf, encamped with his men in the attempt to recapture Madrid and its Alcázar (fortress) from the Christians. The east façade of the palace gives onto the Plaza de Oriente and the Teatro Real opera house. To the south is a vast square, the Plaza de la Armas, surrounded by narrow wings of the palace, and to the south of that is located the Catedral de la Almudena. To the north are the Jardines de Sabatini (Sabatini Gardens), named after one of the architects of the palace. The wedding banquet of Prince Felipe and Letizia Ortiz took place on 22 May 2004 at the central courtyard of the Palace. The palace is open to the public and it is closed when used by the king for state functions like state banquets for visiting heads of state, official government receptions and the presentation of new ambassadors to the king. Estadio Santiago Bernabéu is a football stadium in Madrid, Spain. 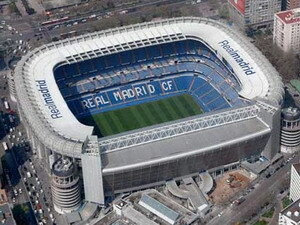 It is the home of Real Madrid. Work on the grounds started on October 27 1944. Originally called Estadio Chamartín after Madrid's previous stadium, it was inaugurated in December 1947. Real Madrid officially adopted the present name, Estadio Santiago Bernabéu, on January 4, 1955 in honour of the club president Santiago Bernabéu. The stadium has been officially sanctioned by UEFA as Elite or 5 Star on its 60th year of its existence. The capacity has changed frequently, peaking at 120,000 after a 1953 expansion. Since then there have been a number of reductions due to modernisations (the last standing places went away in 1998/99 in response to UEFA regulations which forbid standing at matches in the UEFA competition), countered to some extent by expansions. The last change was an increase of about five thousand to a capacity of 79,400, effected in 2003. A plan to add a retractable roof has been announced. 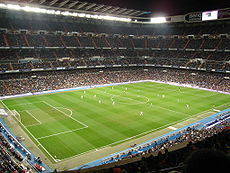 The Bernabéu is one of the world's most famous and prestigious venues. It has hosted the European Cup final on three separate occasions (in 1957, 1969 and 1980), and is scheduled to host the 2010 final. The finals for the 1964 European Nations' Cup and the 1982 World Cup have also been held at the Bernabéu. The stadium has its own Madrid Metro station along the 10 line called Santiago Bernabéu. Its location, in the heart of Madrid's business district, is quite unusual for a football stadium. After its foundation in 1902 the club moved in their first years between some minor grounds before moving to the 'Campo de O'Donnell' in 1912. This ground remained their home ground for eleven years. After these years the club made a move again, this time to the 'Campo de Ciudad Lineal', a small ground with a capacity of 8,000 spectators. This time, it would only be a short stay, because after only twelve months the club moved again. This new ground would make a longer appearance. The 'Estadio Chamartín' was inaugurated on the 17th of May 1923 with a match of Real Madrid against Newcastle United. In this stadium, which hosted 22,500 spectators, Real Madrid celebrated their first Spanish league titles. After those successes, in 1943 elected president Don Santiago de Bernabeu decided that the Estadio de Chamartin wasn't big enough for the ambitions of the club. A new stadium had to be built, which was inaugurated on the 14th of December 1947. This was the 'Estadio Santiago Bernabeu' as we know it today, although it didn't acquire this name until 1955. The first match to be played in the new stadium was between Real Madrid and Portuguese side Belenenses from Lisbon (3-1). Sabino Barinaga scored the first goal in the new stadium. The initial capacity was 75,300. In 1953, a first extension to the stadium was realized with the addition of a third tier. This increased the capacity to an overwhelming 120,000. At the same time a great team was formed in Madrid that would win many trophies in the next years. One of these trophies was won in their own Santiago Bernabeu; their second European Cup against Fiorentina (2-0). In the next years more European Cup finals would be played in the stadium (1969: AC Milan-Ajax & 1980: Nottingham Forest-HSV). The first official match of the Spanish national team in the Santiago Bernabeu was played in the year 1964 (Franco-Stalin). Due to the upcoming World Cup championships in 1982 the stadium had to be renovated again. This decreased the capacity to a mere 90,000. The matches in pool B (Germany, Spain & England) and the final between Italy and Germany (3-1) were played in the Bernabeu stadium. In 1992 the stadium was extended again to a capacity over 100,000 (106,500). At the same the exterior of the stadium was renovated, which resulted in the exterior as we know it today, including the remarkable entrance towers at the corners. This new increase in capacity led to a harsh competition with rival FC Barcelona about which stadium could host the most spectators. This battle was ultimately lost by Real Madrid in the season 1998/1999 when all standing places had to be converted into seats according to UEFA rules. This led to a capacity decrease to 74,300. A new renovation has been completed. This renovation of the east stand has increased the capacity to 80,000 and has made the stadium totally covered. The ex-president of Real Madrid, Florentino Perez, announced in 2005, before quitting the club, a proposal to construct a retractable roof on the stadium. The construction has not yet started.